As you walk in the door, you are immediately struck with the breathtaking view seen from every vantage point. YOU are now in Waikiki and while sitting on your private lanai sipping your favorite Mai Tai, you can watch the surfers, the beautiful ocean and the Friday night fireworks show.... can life get better than this? 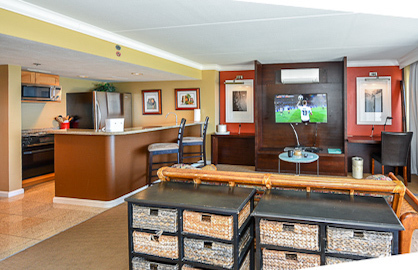 This unit has 2 double beds and a double size futon sleeper. Full kitchen, free internet, free calls to USA and Canada. This newly renovated condo has the glamor of a 5* hotel room but it's yours for a fraction of the price. This deluxe unit has a modern island feel and has been decorated with the highest quality materials. 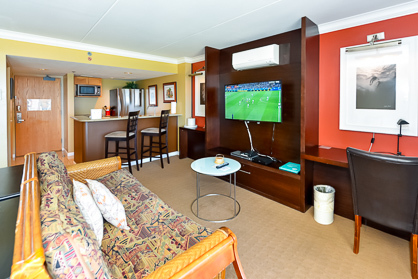 It includes new furniture, 2 new double beds that are like sleeping on clouds, a new 42" flat screen TV/DVD player and a fully-equipped kitchen. So, if you want to eat out, or enjoy a relaxing meal from your own lanai....it's all about options. 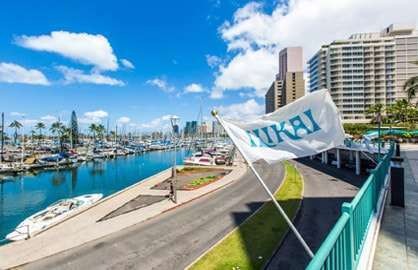 Ilikai 1814 - Great views!!!! The beds were comfortable and the condo was clean with everything we needed for a great visit. Easy instructions for everything we needed. The futon mattress was thin and kind of lumpy for sleeping so it is a good thing I like super firm mattresses. :) Great location and central to what we wanted. Will definitely use this place again if we come back to Hawaii. Mahalo for the use of your condo. My boys, husband and I will never forget this vacation! 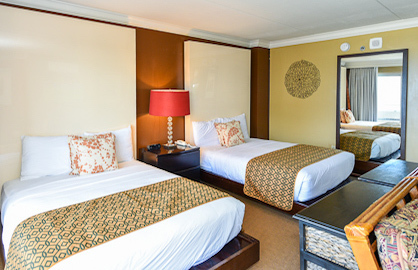 Ilikai 1814 - Loved our stay, great facilities and amazing view. Wouldn't hesitate to recommend or rebook. 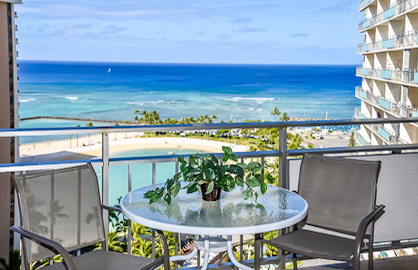 The Ilikai is a fantastic place to stay, offering all the comforts of home in a jaw dropping location. 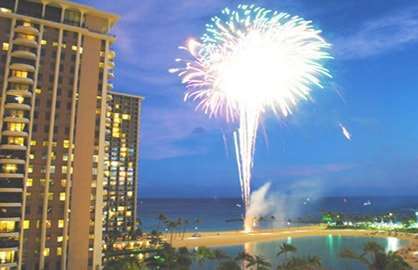 Apartment 1814 gave us a front row seat for the Hilton's Fireworks and Luau, and of course the gorgeous ocean and lagoon. We will definitely be back. Ilikai 1814 was awesome location as we were right on Wakiki Beach. Our view overlooking lagoon and beach was spectacular! Room was very clean and modern decor and included everything we needed for our vacation. 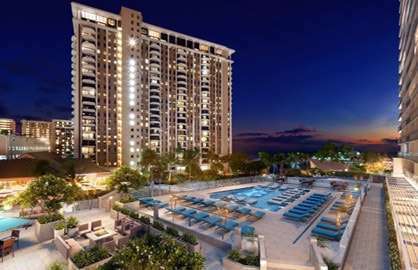 Just returned from a quick trip to Oahu and a stay at Ilikai condo 1814. Condo was perfect with everything I needed for a 2 1/2 day stay. I appreciated the convenience of the store at the Ilikai for incidentals that I needed and being able to have a drink in the bar. 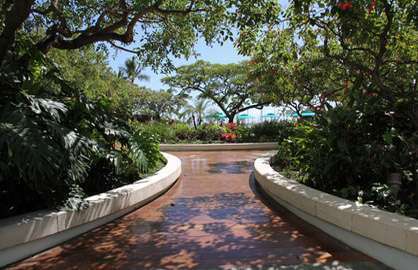 The Ala Moana Mall was within easy walking distance and the view from the lanai was fantastic! We recently returned home from our 2 week stay in unit 1814 and this was our second time staying in this unit. 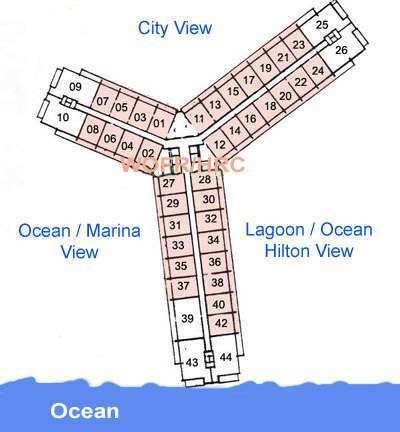 It is in the perfect location. You get the sun from early morning to late afternoon on the lanai. I enjoyed getting up early and sitting on the lanai with my coffee watching the sunrise. We were fortunate enough to see the fireworks twice during our stay and you cant get any better front row seating. It was spectacular! The beds are comfy and the kitchen has everything you need. The free Wifi and long distance calling was a bonus. 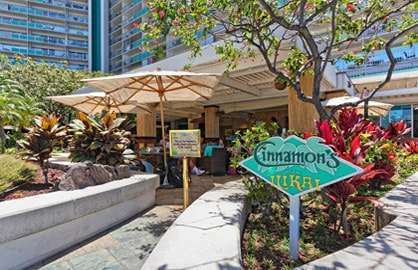 The Ilikai is in the best location in Waikiki. You will not be disappointed in your stay here. From the ease of online booking and the no hassle checkin to the keyless room entry this is one of the best ways to book a vacation. 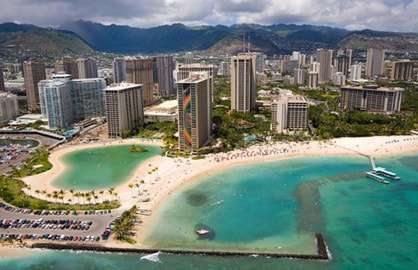 Thank you to the team at Waikiki beach rentals! We spent the first 5 nights of our Spring Break vacation in this unit and absolutely loved it. We are a family of 5, with 11 and 9 year old boys and a 4 year old girl, and the condo was the perfect size. The location is perfect, the views spectacular. 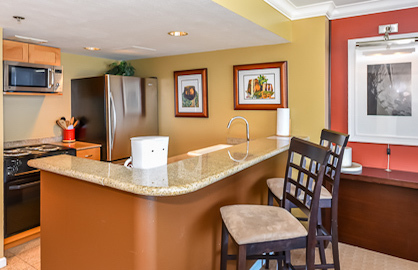 Having a kitchen cut down on costs and it was also very convenient to be able to eat in our unit between activities. 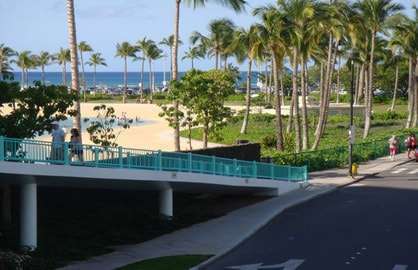 This unit has a fabulous view of the Hilton Luau, so we were entertained most nights of our stay just sitting on our own balcony. We loved watching the surfers on the beach and the activities in the lagoon. We even saw humpback whales playing in the waters off Waikiki! 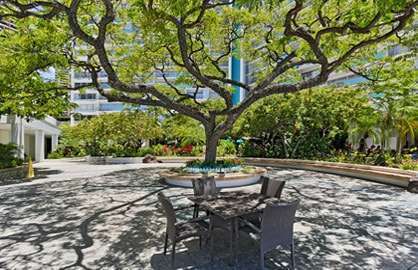 We have stayed in many other hotels/condos in Waikiki over the years, but this is the one we will definitely plan to come back to on our next trip. Thank you for your hospitality! Had the most wonderful time in Waikiki and could not have asked for a better condo to stay in. Breathtaking view from the lanai and it was nice and cool inside even without the A/C. Looking forward to booking with you again! Our family of 4 stayed in unit 1814 for a week in June 2014. We had a great trip, and we would select the same unit for a return visit. Check-in was very smooth, and the room has a fantastic view. Interior decorations, carpet, beds, TV, dresser were in great shape. Refrigerator and appliances were new. Warning: the coffeemaker does not turn off automatically. The unit was furnished with plenty of towels, wash cloths, beach towels, a roll of paper towels, salt and pepper, several coffee filters, a small bottle of dishwashing soap, a sponge, a box of Kleenex, and 2 rolls of toilet paper. Concerns: no small glasses and the silverware and plates were standard rental mix. Furniture on the lanai was worn. There is a rental car agency in the lobby, so we could book a minivan for $99 per day. However, you cannot turn the car in until the next day, so we had to pay the $28 valet fee each day we rented a car. 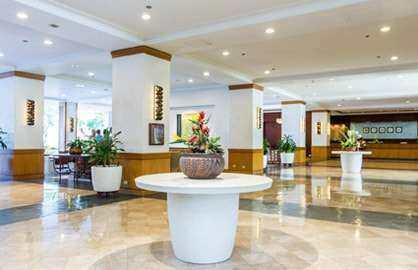 There is a concierge in the lobby we used to book Atlantis submarine trip, bus trip to Pearl Harbor, and Germaine's luau. It is an easy walk to the beach. 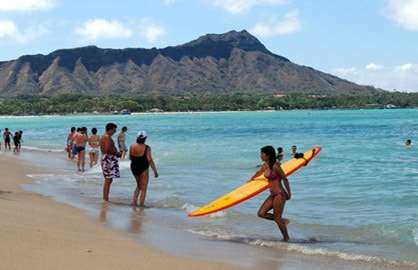 You can walk on the beach all the way to Queen's beach in the heart of Waikiki. We also walked to the capitol and 'Iolani palace, but I would not recommend it as the route goes through some less attractive areas. There is an ABC store across the street with a lot of convenience items: snacks, soap, tee shirts, fruit, milk, juice, beer. 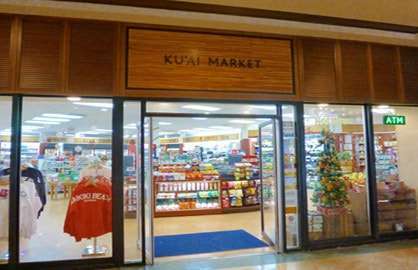 There is a Don Quijote grocery store nearby that has decent prices for a much larger selection of food items and souvenirs. We enjoyed our stay in unit 1814, it catered to all our needs and the location was fabulous. We would recommend your unit to all our friends. Thank you! Beautiful place and perfect for my family (two kids 4 and 8.) Our only regret is that we did not stay long enough! I will recommend the Unit to all I know! 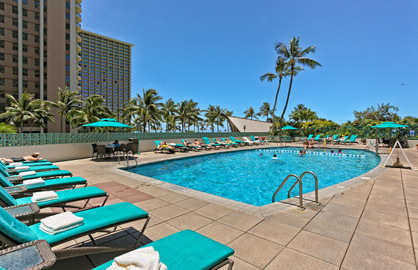 Thank you soo much for recommending unit 1814 at the Ilikai hotel resort We had a fabulous time in Hawaii, the Ilikai was soo central to everything and the views blew us away, we got a view of the Hilton's cultural nights performances, views of the fire works on Waikiki beach, the ocean, lagoon and pool. 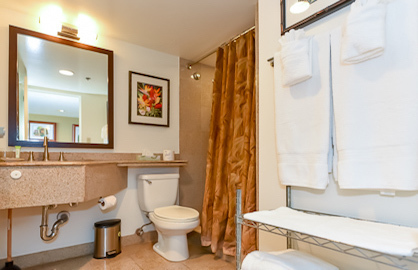 We loved the unit and used the facilities available to us. I loved the easy check in and also thank you Bert for the late check out as it helped having a late flight back home to NZ. 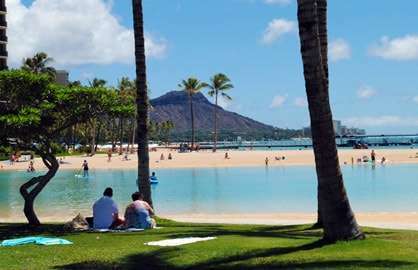 Loved the Waikiki trolleys and Ala Moana shopping centre, food courts, Walmart, and Ross and many many more. We didn't want to leave Honolulu. Loved the units self contained with fridge, cooking facilities and everything available for our use. Having free internet access was a bonus! One other thing I really appreciated was the friendly cleaners as we would pass in the hall way and the bell boys, pool attendant, and safety having a 24 hour security watch in the hotel. 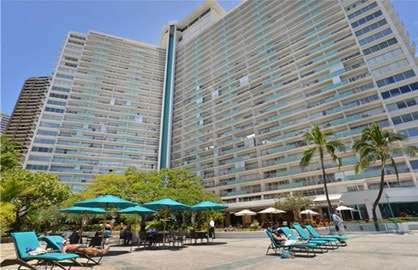 Just want to say thank you and will be coming again in July 2011 for my mum's 60th birthday and we are definitely staying at the Ilikai. Mahalo! 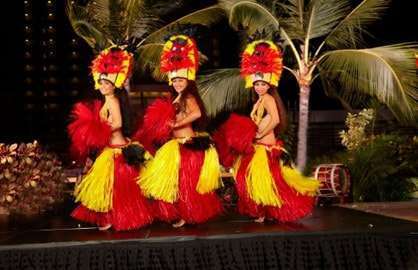 P.S.the band and the two hawaiian dancers down at the ilikai bar and grill was great to enjoy! 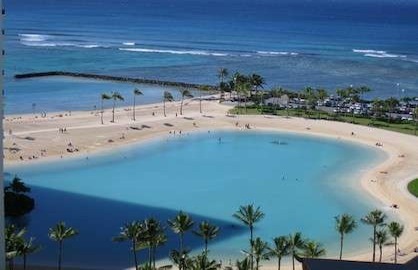 Beautiful hotel/resort I recommend 150% to anyone travelling to Waikiki. We rented 3 units for 10 people lots of room and space in the units and in the entire hotel. !